Working in collaboration with the RMIT Centre for Game Design Research, M@STUDIO Architects and d_Lab RMIT the 'If Only...' virtual reality installation was designed to complement the 2016 NGV Architecture Commission “Haven’t you always wanted…?” by M@STUDIO Architects on display in the NGV gardens. Utilising the HTV Vive the project enables visitors to redesign the architecture in virtual reality. 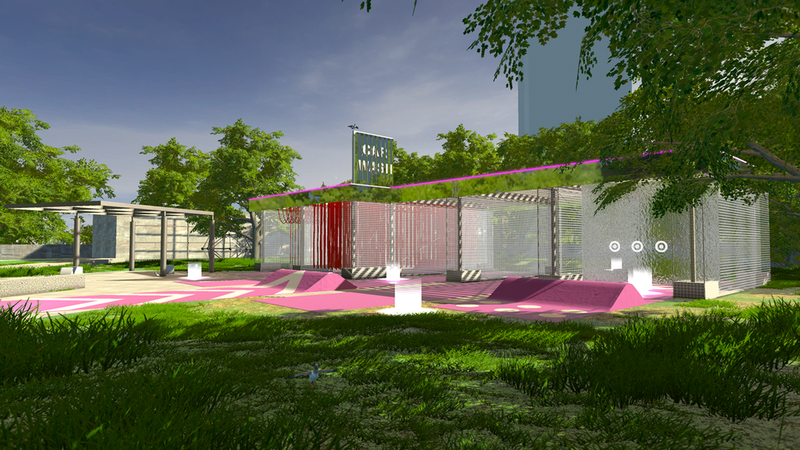 In a digital world set within a hyper-real version of the NGV Garden, visitors are invited to select new colours, materials and surfaces for the architecture. This world simulates the passing of a whole day in only three minutes: colours shift, planets loom large, day rapidly turns to night and the backdrop of virtual Melbourne morphs into a scene of peace and solitude, surrounded by trees and the starry night sky. Each change made to the structure results in shifting light and shadow patterns – highlighting the potential of virtual reality as a tool for design and architecture. 2pt were responsible for 3d modelling, interaction design, technical art and programming.